The Features: Past perfect. 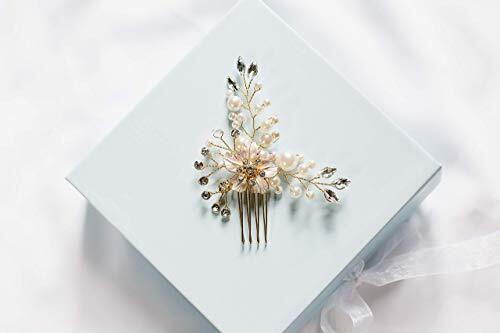 A vintage-inspired hair comb featuring a gold, white-brushed oleander flower accented with pearl beads, marquise rhinestones, and crystal beads. The Look: Overlay with a veil to add a romantic illusion. The Details: Flexible wire for customized fit and styling. View More In Side Combs. If you have any questions about this product by Shirley & Audrey, contact us by completing and submitting the form below. If you are looking for a specif part number, please include it with your message.